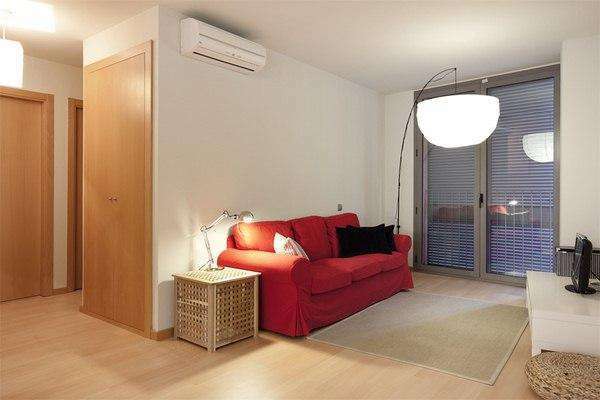 Modern and comfortable apartment situated in the centre of Barcelona, close to the famous Palau de le Música. This stylish apartment has been completely renovated with parquet flooring, a light colour scheme and a modish design. It has two bedrooms, both beautifully decorated. One has a double bed and the other a single bed, allowing the apartment to accommodate up to four people. The living room has a TV and a comfortable sofa, as well as access to the balcony. This apartment also has an Internet connection, so you can keep in touch with friends and family at home. The fully equipped American kitchen has all of the modern appliances and utensils you would need to prepare your home-cooked meals. The bathroom is tiled and well-lit, with a walk-in shower. This fantastic apartment also has air-conditioning and a washing machine for your comfort and convenience. Within walking distance from Plaça Catalunya, Las Ramblas and the Barcelona Cathedral, this beautiful apartment is ideal for anyone wishing to stay in central Barcelona, close to the best tourist hot-spots of the city. There are two more apartments in this building, with references CR1080 and CR793. PLEASE NOTE: THIS APARTMENT IS ONLY AVAILABLE TO ADULTS OVER 28 YEARS OLD, COUPLES AND FAMILIES.